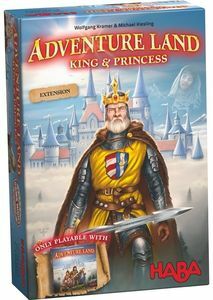 Adventure Land: King & Princess features three new scenarios, as well as new components, for Adventure Land that bring even more variety into play. There are various challenges awaiting heroic adventurers: The princess has been kidnapped, the super fog creatures are attacking the capital city, and the king needs to be protected. The three new and very different scenarios make it continually varied and always exciting. Who will be the first to collect all the keys and have enough combat strength to rescue the princess? The players fight together against the super fog creatures in order to survive this cooperative adventure. The full game board entices you with herbs, swords, and companions. Who can protect the king and collect the most of each item?